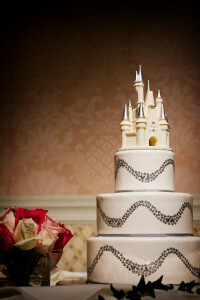 Disney’s Fairy Tale Weddings in Florida provides Wishes Collection brides and grooms with a PDF containing images of many standard wedding cake designs, along with mini cakes and groom’s cakes. Although you are not restricted to these choices—and Disney is known for its execution of custom cake designs—this document and its corresponding pricing sheet will give you a good idea of how much Disney charges for various cake sizes and levels of complexity. It also lists the prices for the various styles and sizes of white chocolate castle cake toppers. For photos of the standard Escape Collection wedding cakes, CLICK HERE. Disney’s projection-mapping cake costs $2,900 for a 5-tiered fake cake and counts toward the Enhancement Minimum for a Wishes Collection event. If you would like any of the layers to be real cake, you will pay extra for those. There are several standard designs (three of which can be seen in the video below), or you can pay $4,500 extra to have them customize the video with your own photos. The projection is seen on the front two sides of the cake. A white chocolate castle cake topper like the one shown in the video costs $125 extra. ????Hi! My name is Biryukov Dmitry, the founder of “Luma Cake” – a light (3d mapping) show on festive cake. I and my team we organize a beautiful and unusual show. I think our work will interest you! We organize and we leave on actions: Wedding, Birthday, Office party, Parties, Exhibitions and delivery of awards, etc. The show the program is developed individually on your holiday’s eve or it is possible to choose already ready program. Cake can be round and square. I personally control each held action. ✈ Now we actively develop and we begin to work across all Russia, the CIS and Europe, Asia and USA! At the moment we begin to take orders for a season 2018. ❗Reserve your date of a holiday already now! To receive particulars write to Direkt! I’m planning a wedding for next year on November, how would someone from Florida buy a cake that does that? Can you only purchase the cake by itself without having the fairytale wedding at Disney World? Disney doesn’t rent or sell the projection cake outside of Disney’s Fairy Tale Weddings. I would Google “projection mapping wedding cake” and see if there are any event companies in your area that offer a similar service. I absolutely love this disney projection cake? Does anyone know someone who could make something like this for me in the united states maryland! or someone who can deliver it? Do you sell the small mickey head cut outs? Hi Veronica! I don’t sell anything. If you are looking for Mickey-shaped confetti, you can find it on Etsy: http://www.etsy.com! Do you have a list of all the cake flavors and fillings? Do you know how much extra it is to have the photomapped cake edible? They can’t make the cake that they project images onto edible. You would just buy sheet cakes and have them hidden in the kitchen before serving. Those prices are in the Pricing Sheet linked above: $55 (25 servings)–$120 (100 servings) each. I would like to know a phone number to call and or adress to know to know more about the cake…. I would like it all to be real cake for 230 people but to know prices, flavors and all the required information needed. I live close by to Disney in California. I’m in the middle of planning my Wishes Wedding (early stages – April 2018! ), I’ve had a good read through your website and your book but I just have a quick question about cakes. I have 20 guests, I’ve read that I have to have a minimum ‘guest count’ of 50 for cake purposes, does this apply for mini cakes too? For the same price as the cheapest big cake I could get 20 mini cakes and I would much prefer that, do you know what the minimums would be for mini cakes?! All these different minimums for different things are confusing the heck out of me!! Hi Catherine! There is no requirement that you get a certain type of cake. If you want mini cakes instead of one big wedding cake, that is fine. The Minimum Guest Count is used to determine the total price of the cake, because Disney prices them by person. So if you want a cake that looks like the one in the picture, it will feed a minimum of X people at $X per person. Disney doesn’t change the size of the cake to fit your group size. For example, if you want a cake with a 50-person minimum that costs $14/person, you will have to spend $700 even if your party is only 20 guests or 35 guests or whatever. You’ll just have a lot of leftover cake. 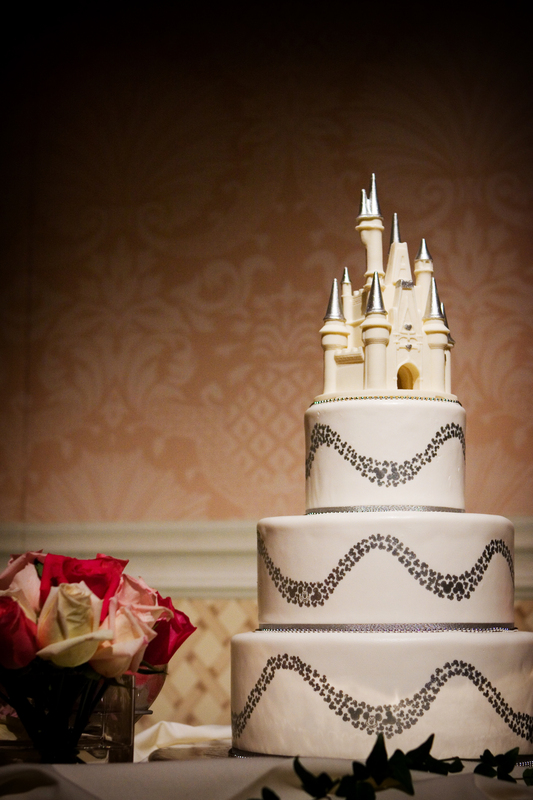 The projection cake is only available at Disney’s Fairy Tale Wedding events held in Florida and California. They do not sell the cakes or the projector. Do you know if I can purchase one of those white chocolate small castle and have it shipped to me? Yes! Here is the online order form for the small white chocolate castle. To learn more, check out this episode of the Disney Wedding Podcast. Can you find a cake like this one near Houston and instead of a wedding can u do it for a quinceanera???? I would take the photo of the cake you like and show it to a local bakery to see if they can re-create the style for you. Hi Tiffany! I do not work for Disney. I am the author of an independent guide to Disney weddings. If your sister is having a Disney’s Fairy Tale Wedding, her planner is the one you need to talk to. Otherwise, unfortunately, Disney does not ship cakes. But you could show these photos to a local baker and ask him or her to re-create a certain look. this technology in iran cost only $300 for a full fake wedding cake covered by cream and using 2 6000 ansi projectors , and 6 hours shining continuously ! Unfortunately, I don’t. But any good cake baker should be able to work from a photo to create the cake you want! Hi Brandy! I’d find a local bakery that does fancy cakes for weddings and birthdays and send them the photo. They should be able to re-create it. Hi! You can see a video of the new photo-mapping wedding cake by clicking HERE. It costs $2,900 for a 5-tiered fake cake, and that amount counts toward Disney’s Enhancement Minimum. If you want any of the layers to be real cake, that cost would be extra. There are three designs (all three are shown in the video) or you can send in your own photos. I’d love!! To recreate this for my wedding day! I guess you would need to find a projection-mapping company in Dubai who could figure this out for you. Hi You would need to find a vendor in Saudi Arabia who offers digital projection mapping. I would start with event planners or party planners in your area, or even just search on “digital projection mapping.” You might find a company that has never done a cake before but would be willing to try it out for you. Good luck! This cake video projection is copyrighted by Disney. They do not allow it to be shown elsewhere.